With its size only 24″ x 24″ x 9″ high, the LiveVibe is the latest in vibration therapy that detoxifies and strengthens the immune system. The technology behind whole body vibration has been used since the 1960’s. It has been used to regain muscle strength, bone density and most of all, reduce recovery time. Because of the many benefits the Live Vibe offers, it has become a favorite of many universities, professional sports teams, and medical facilities. The vibrations from the Live Vibe are transmitted to the body by either the hands or feet. Your body naturally adjusts to the movement by using a stretch reflex reaction which has positive neurological effects on the brain. After the treatment, the brain is stimulated and functions in a healthier state. Other fantastic benefits of the LiveVibe are its ability to help patients heal up to two times faster than conventional training done alone. Each session on the LiveVibe should last no longer than 15 minutes and the patient can control their workout duration. Maximum Person Weight = 300 Lbs. Adjustable speed ac motors: Many units on the market use AC motors and control the speed with a rheostat. What the rheostat does is control the speed by limiting the amount of current the motors can pull through a resistor. This is NOT a good way to control speed. The proper way is with an AC inverter which varies the frequency, but an inverter could cost more than the vibrating unit itself. If you don’t take our word for it, Google the topic – it’s a big no-no in the electrical world. There is a lot of research that shows vibration in the 30 hertz range is what is needed for Whole Body Vibration and that it shouldn’t change. The only thing that should change is how long you stay on the platform. The LiveVibeTM vibrates at a constant 30 hertz – and as we mentioned before, each session should only last 15 minutes. Weight and Size: Find a unit that is heavy enough to stay in place. 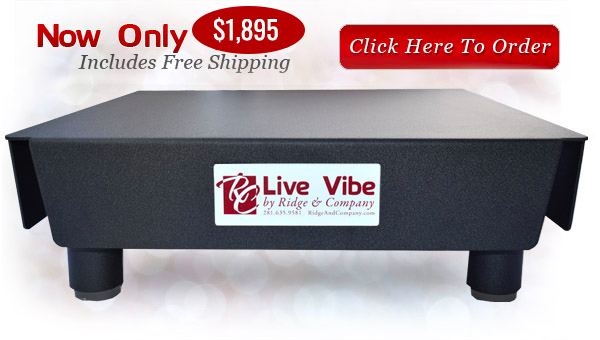 The LiveVibe weighs a manageable 63 pounds and is 24″ x 24″ 9″ high. The weight and size of this machine is only part of the factor in not scooting across the floor while you are standing on it. Vibration Isolation between platform and the floor: Many of the lower priced and even some of the higher (>$2000) priced units have no means to isolate the vibration to the platform, ie, the platform is rigidly attached to the feet. The LiveVibeTM has four rubber mounting pads that isolate the platform from the frame which means the majority of the vibration goes to the user and very little to the feet. This makes the unit quiet and it stays where you place it. Units that do not have this feature lose a vast amount of the vibration energy to the floor!! How long is it going to take to get my unit? Ridge & Company has a goal to always keep enough units in stock to provide same or next day shipping. We encourage you to do the research. To find a vibration platform that has the same features as the LiveVibeTM, you’ll be spending in excess of $4000. We are offering the LiveVibeTM for $1495 with Free Shipping FOB Willis TX. Our goal is to provide quality products at reasonable prices and we believe we’ve reached the goal.